Politicians from across the political spectrum came together last night in Glenrothes to jointly oppose the closure of the Out of Hours Service at Glenrothes Hospital. The meeting, organised by Glenrothes Area Residents Federation was addressed by the town MSP Jenny Gilruth (SNP) as well as Claire Baker (Lab) and Alex Rowley (Lab) who are regional MSPs for the whole of Mid Scotland and Fife. Ms Gilruth started by paying tribute to former Labour MP for the area, Lindsay Roy, for the role he played five years ago alongside her predecessor Tricia Marwick, in fighting for the retention of the out of hours services. She stressed the need for unity among elected representatives on the issue and outlined the importance of the facility to the town. The information on the temporary closure of the out of hours services in St Andrews, Glenrothes and Dunfermline was communicated by Fife Health and Social Care Partnership while the Scottish Parliament was in recess and local politicians were not given any advance notice. Last week, Ms Gilruth asked a question in the Scottish Parliament to First Minister Nicola Sturgeon and was advised that Fife Health and Social Care Partnership would be running a consultation on the issue in the next few months. At the meeting last night, Ms Gilruth argued that this called into question how temporary the closures actually were and asked local politicians and the community at large to come together to support the retention of the service. Claire Baker MSP pointed toward the number of GPs who help to staff the out of hours service as being a potential part of the problems being experienced. She said that there were “issues around GP contracts”. A number of local councillors made valuable contributions and there was wide condemnation of Fife Health and Social Care Partnership for not sending anyone along to the meeting to represent their views. Members of the public, including those with a nursing background, raised concerns about the safety of people locally who may not be able to afford a taxi to Victoria Hospital. . 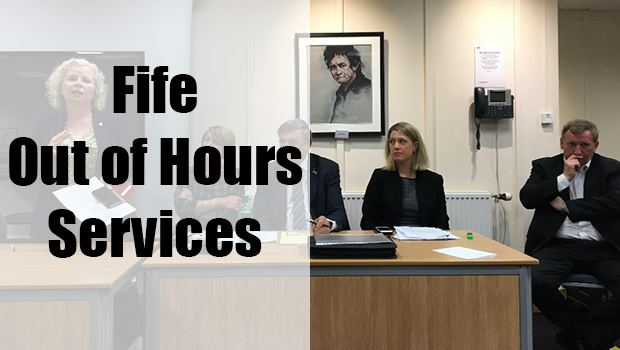 It is clear that this round of the fight to save our of hours service provision in Glenrothes is only just beginning but there seems to be no lack of appetite for the battle ahead, if this meeting was anything to go by. Fife Health and Social Care partnership announced earlier this month that out of hours services would stop between Midnight and 8am for three months. Lomond Quarry Branded “potentially a nuisance” by Report.